If you've been keeping up the past couple of weeks I've been posting about different people that I wanted to acknowledge that really made my collegiate career the best that it could be! I talked about a few of my internships, one of my mentors, two of my favorite professors and my best friend. That really only leaves one person, well two people actually, my parents! My parents are the most important people in my life and without them the past four and a half years would not have been possible. I am forever thankful for them and all that they have sacrificed for me to go to school. From late night study sessions where learning all of the countries in Africa was a thing freshman year, to having to learn everything I possibly could about how sports teams make money in Sport Finance my senior year, they were there. My parents were there through all the major meltdowns when I thought I couldn't do any of the math problems I was assigned and barely passed statistics. They were also there when I finally decided on a major and stuck with it and really encouraged me to make the most of all seven internships I did over the past few years. My mom... I don't even know where to start when it comes to this ball of sunshine. Maybe it's best to say I love you, Mom. You're the best. Thank you for always seeing the best in me, even when I couldn't see it in myself. Thank you for helping me get through all of those projects and nights where I thought college was stupid. Thank you for instilling in me that at 22 or 122 going to Disney is always a good idea. Thank you for having random dance parties to One Direction's "What Makes You Beautiful" and picking a favorite member. (For those of you wondering it's Zayn.) Thank you for believing in all of my crazy dreams, like wanting to move to the UK and work in sports somehow. Thank you for encouraging me to never give up on those dreams. Thank you for allowing me to think outside of society's box that has been placed on so many young people's lives of what we are supposed to like and what we are supposed to do. My dad... Well again I don't even know where to start when it comes to this goofy guy, so I love you is always the best way to start. You're the best! Thank you for always putting my needs above your own. Thank you for taking me out for random Sweet Frog dates, even if your day hasn't been the best. Thank you for all of the advice on how to deal with people who I might not necessarily get along with. Thank you for always being "just the bus driver" when it comes to going to Disney, but in the end you always make the trips so special. Thank you for always letting me ride on your shoulders when I was little so I could see the parades better and so I didn't get tired. Thank you for instilling in me that 80's rock is just as cool as today's music. Thank you for always encouraging me to be my own person and take adventures, even if that means making mistakes. I could never repay the both of you for all that you have done for me. 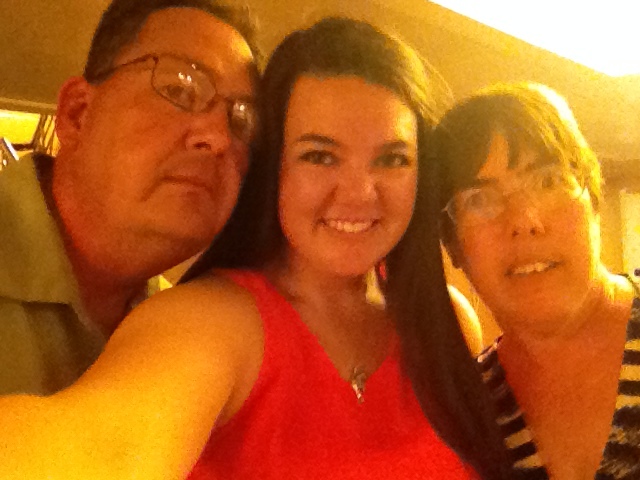 I love you both so much, and even though I'm graduating from college tomorrow I will always be your little girl.